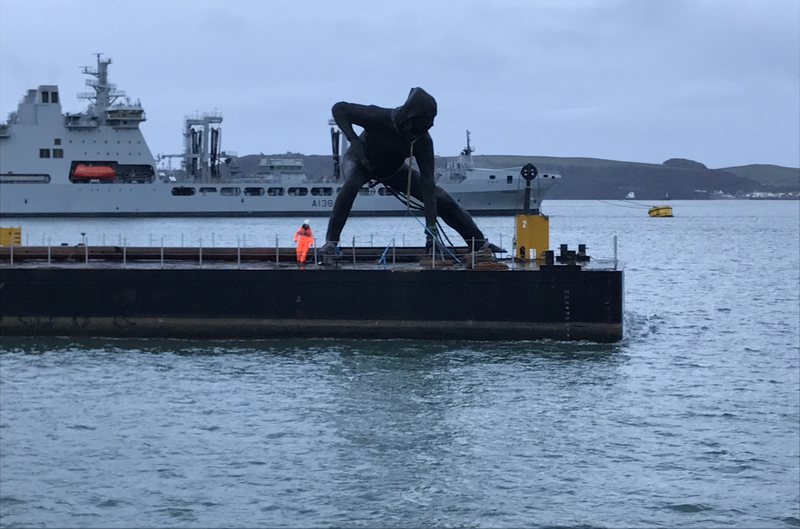 Weighing in at nine and a half tonnes with a height of seven metres (23ft) and nine metres (30ft) wide, Messenger by Joseph Hillier is the largest cast bronze sculpture in the UK. It has been commissioned by the Theatre Royal Plymonth as part of the regeneration project. The Maquette Messenger will feature at Beaux Arts London. 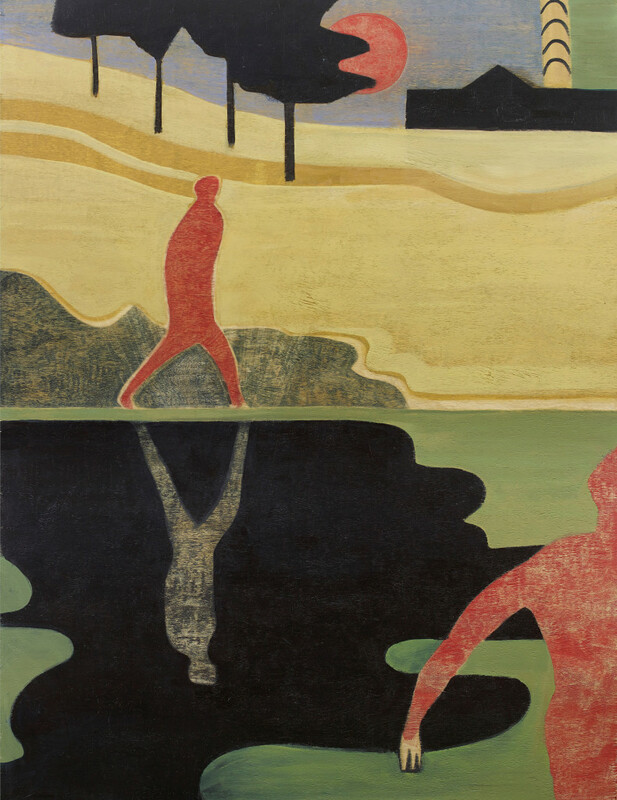 Anne Rothenstein opens at Beaux Arts London with her much anticipated third Solo Exhibition of new figurative paintings and landscapes. A catalogue and price list is available on request. We have the pleasure of announcing Nicole Farhi and her current Solo exhibition FOLDS at Beaux Arts London will be featured on Sky News. 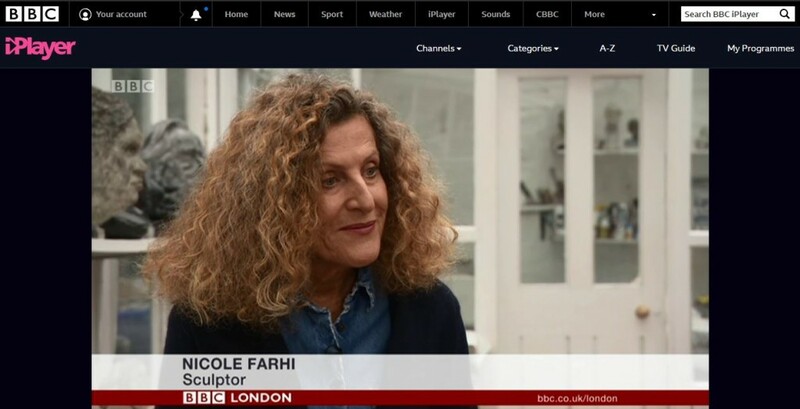 Nicole Farhi is interviewed by Sarah – Jane Mee talking about the transition in full time sculpture, her inspirations and the current FOLDS Exhibition. The Exhibition is open Monday to Saturday 11 – 6pm and there is a catalogue available on request. Nicole Farhi Solo Exhibition at Beaux Arts London featured as one of the best exhibitions in London to see in Time out. Nicole Farhi’s Solo exhibition also featured in the Financial Times, Wallpaper Magazine, The Times, The Evening Standard. Please find a full list of articles under Exhibitions or Nicole Farhi on our website. 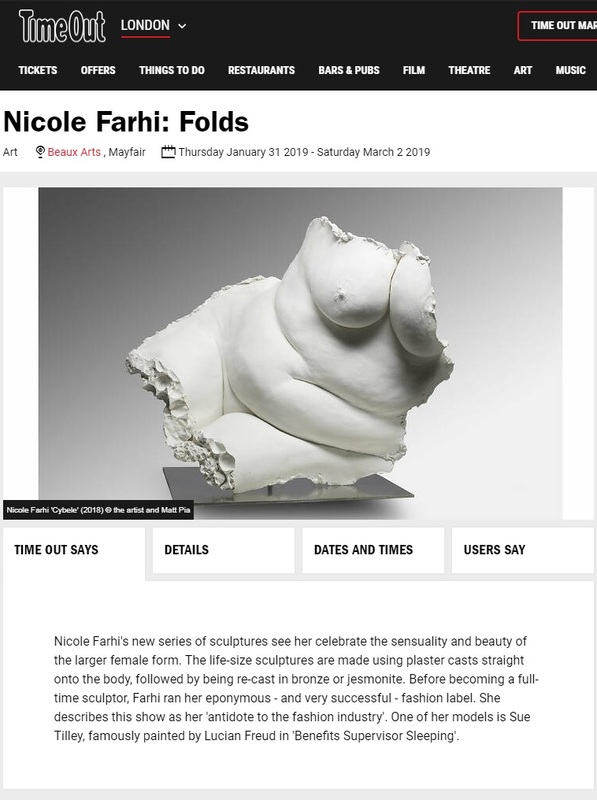 February 2019 Nicole Farhi on BBC Radio 3 – 2 February 2019 Cultural inspirations from guest of the week, sculptor Nicole Farhi with Suzy Klein at 10:50am. Nicole Farhi Upcoming Solo Exhibition featured in British Vogue. We have the pleasure of announcing Nicole Farhi will be featured in British Vogue on Sunday 23 December 2018 talking about her inspirations, being mentored by Eduardo Paolozzi and the incredible body of work FOLDS that will be shown at Beaux Arts London from 31 January 2019. 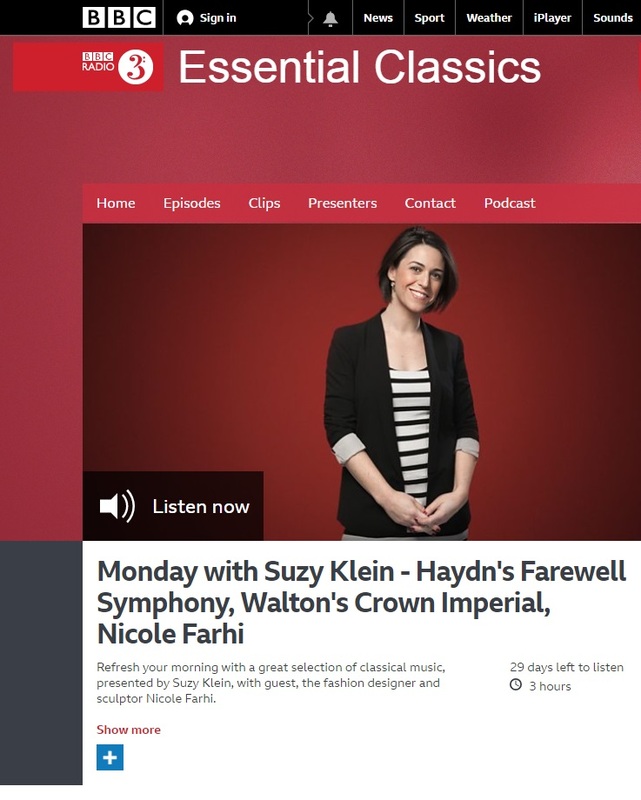 Joseph Hillier on BBC Radio 4 – 26 November 2018 with Kirsty Lang at 7:15pm. 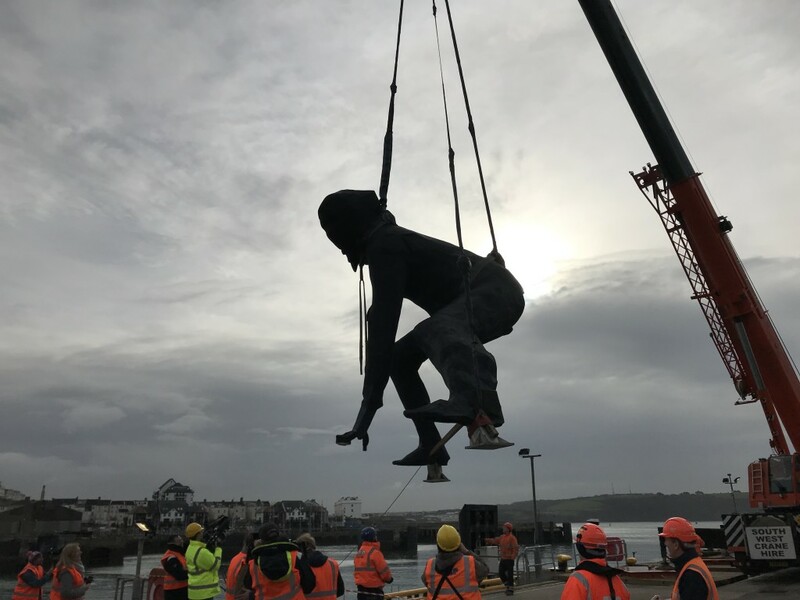 We have the pleasure of announcing Joseph Hillier will be featured on BBC Radio 4 at 7:15 pm in which the artist will be discussing his latest sculpture Messenger which will be unveiled in the Spring. The seven-metre high sculpture Messenger (based on the maquette) depicts a crouching young female actor commissioned by the Theatre Royal Plymouth – Still in Progress. The title Messenger refers to the role of an actor in breathing life into the words of a writer. It is intended to embody the theatre’s – and city’s – energy and creativity. Joseph will be featuring in our upcoming exhibition ‘Sculpture: Modern and Contemporary’ alongside some of the most significant artists from the twentieth century and other established contemporary artists. Elisabeth Frink on BBC Radio 3 – Tuesday 13 November 2018 at 10pm. We have the pleasure of announcing Elisabeth Frink will be featured on BBC Radio 3 at 10pm in which the artist will be discussed by Annette Ratuszniak and Calvin Winner, curator of Elisabeth Frink show at the Sainsbury Centre for Visual Arts. This major thematic exhibition is coinciding with Beaux Arts London bringing together the largest and most significant presentation of her work since her death 25 years ago. Horse and Rider by Beaux Arts Artist and Royal Academician Elisabeth Frink was unveiled in her new location this week standing proudly outside the Royal Academy. This was to celebrate the transformation work across Bond Street and the The Royal Academies new galleries at 6 Burlington Gardens. Do visit the work and come visit us at the gallery in Maddox Street to see further works by Elisabeth Frink in her solo exhibition until 1 December 2018.